The project is for the planning and detailed design phase of upgrades to 12.6 kilometres of the Bruce Highway at Rockhampton, from the intersection connecting the Capricorn Highway through Rockhampton to the intersection connecting to Yeppoon Road . The project will look at options for the construction of roads and bridges in order to provide a Q100 immunity sealed highway north of Rockhampton. The project will also look at options for sealing works, road reconfigurations, the installation of a flood height monitoring system, relocation of services, delivery of service facilities intersection upgrades, and the construction of new intersections, riverbank upgrades and upgrades to connection roads. 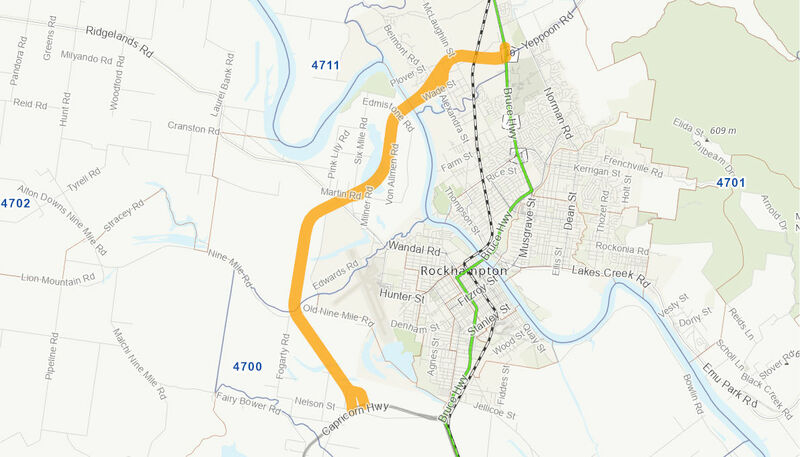 Anticipated benefits of the project, when and if constructed, will include safety and capacity issues on this section of the Bruce Highway resulting in reduced congestion and improved network efficiency by increasing road capacity and reducing travel times through Rockhampton. The project will also improve network functionality, accessibility and regional capacity which will support future development in the Rockhampton area. The Australian Government has committed up to $52 million towards the $65 million planning project, in partnership with the Queensland Government. The planning project commenced December 2016 and is expected to be completed mid 2020.